Shintani Naritada is an artist and muscian living in Tokyo, Japan. 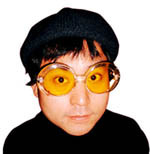 His current project is Dokuro-Tarou a website and concept album of "The imaginary Tokusatsu Hero Dokuro-Tarou"
Nari as "New Wave Samurai"
E-mail interview by Todd Ramsell with Shintani Naritada conducted January 2002. English translation by Nari's "translation machine." 2. Did you go to art school or a university? Did you enjoy it? I went to school of an anime at the time of 18 years old. There was the school in Tokyo. I got a lot of friends at school. But I felt it. There is not my picture in a field the same as a Japanese manga & anime. 3. Where do you live now? Does it have a good creative community that supports you? I live in TOKYO now. As for TOKYO, pop culture prospers most in Japan. And I belong to no community. A Japanese artist is loneliness. 4. Did you learn to draw manga on your own or in school? Did you have a mentor or someone you learned the art of making manga from? I do not study Manga. And there is not a leader. I studied by self-education and advice of a friend. 5. When were your first manga stories published? It was 1989 at first. The comics were stories of youth. It is 1993 that I got a current style. 6. What publications has your work been in? I worked with biggest publishing company "KOUDANSYA" in Japan from 1989 to1993. I work with smallest publishing company "HOKUTOUSYOBOU" to date from 1993. The company which published "AKIRA" is "KOUDANSYA". 7. What Japanese manga do you enjoy most? "NEZISHIKI" by Tuge Yosiharu (surrealism comics). 8. Do you have any favorite European or American cartoonists or artists? There are some comics imported for Japan. I got close to "Tom&Jerry" "Spider Man." There are many favorite things in comics to take seem to be Todd Ramsell with web currently. 9. What are your influences on your manga? Anything that inspires you? 10. What are your favorite films? 11. Have any favorite music or musicians? 12. Have any hobbies or collect anything? I play with a synthesizer. I play with a drum. And I do a collection of monster TOY. 13. Do you work a day job or do you live off of your artwork? It is a scanner operator usually. A holiday draws comics. 14. Do have anything else you'd like to say to the readers of Polypop? The primitive man drew comics on a wall.As for the comics, it has been got close to people for a long time. But comics do not mature. So comics are interesting. Artists continue an experiment. World comics are mixed with web. A new comic will be created in the future. Polypop will become a pioneer.